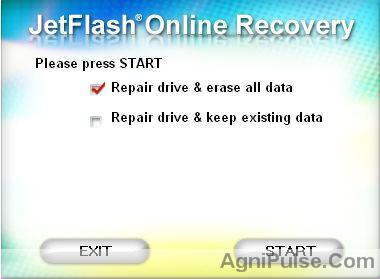 JetFlash Online recovery is a USB Tool Developed by Transcend to repair the JetFlash USB Drives .These USB Drives use the Alcor Chip and the JetFlash Online Recovery is basically a wrapper for the AlcorMP Mass Production tool.This tool requires a internet connection and can fix bad sectors and other formatting errors.It also fixes any damage caused by AlcorMP Mass Production Tool .So if you have changed your JetFlash USB Drive to a fixed drive or if you have created a virtual CD-ROM partition using AlcorMP Mass Production Tool ,then JetFlash Online recovery can bring back your USB Drive to its original state i.e, without CD-ROM Partition etc. 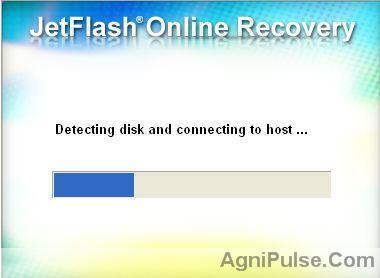 JetFlash Online Recovery is advanced new software specifically developed for Transcend’s JetFlash USB flash drives. It repairs your flash drives immediately through simple and user friendly interface. With such effective, safe and reliable solution, it can save your precious time and money bringing your product for traditional RMA service. Wherever you travel, Transcend JetFlash Online Recovery services you 24/7 on the internet. Select the capacity of your USB Drive. The tool checks your USB and connects to the internet.If you had selected a wrong capacity in the previous step,then you will get an error here. Choose Repair drive & erase all data and click on Start.The other option Repair drive & keep existing data does not fix all problems. Your USB drive will be formatted.This formatting is different from the Format option available in Windows as this tool uses the Alcor Mass Production Tool to format your USB Drive.In this process the Alcor Chip in your USB Drive is reconfigured.This process may take some time. When the format is complete, please press “Exit,” then unplug the your USB Drive and plug it back in to your computer. Note:This tool creates a Temporary folder at %temp%RarSFX0\OnLineRecovery.Here you can find the tools that were actually used to format and repair your USB Drive. This webpage contains a huge number tools related to USB Drives with the Alcor Microcontroller. You can scroll down in the link and try your luck with other recovery tools for Alcor. 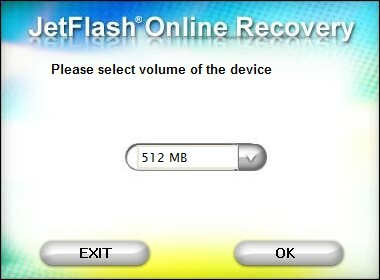 It also contains all the versions of JetFlash Online Recovery Tool. thanks for this software. it really works and revived my flash drive. thanks God He let someone who created a software who can work like this. i can now use my flash drive like before and the money i used to by is not wasted like some brands. thanks again. good job and may your tribe increase. can’t revive my fLash drive, but thanks…. THANK YOU for publishing this! I have searched for a few days on how to recovery my data and get the USB to be recognized again. Thaks U r so great…………. realy amizing boseeeeeeeee. Find out the PID and VID and reply here.Then maybe we can find the correct tool to repair your USB Drive. Thank you very much bro! Your the man..
i have a problem with my pny pendrive.when i’m using jetflash online recovery,it say that no device detected.but i already inserted my pendrive.what should i do? ?plz help me..
i’m using a 8GB transcend flash drive,there is a error MSG “write protected”,i try so many ways,like reg-edit,command prompt and normal formatting ways.but still i cannot find a proper way.i try to use online recovery tool and jet flash recovery tool also,bt when i’m using that there is a error MSG like “your flash drive not recognize”..but I’ve already connected it. plz if u can help me………nirmitha. It was beautiful experince to get back my pen drive. Thanks a lot. I am using 4GB Transcend Pen Drive for the past 2 years. I inserted the Pendrive and while shutting the Windlows, I forgot to remove the Pendrive safely. After a while when I started switching on the Computer, the Pendrive is not working and the icon is not shown in the task bar. Please repair my Pendrive to get back the Pendrive to use again and showing my files stored in the Pendrive. 2 gb jet flash pen drive attach pc but problem r display for removable disk. Thank You.I can’t express how this post rescued me ….. The above link has Recovery tool based on your VID and PID . It worked for me VID = 058F PID = 6387. 1. people ask to look lock switch = of course there are no switch!!! 2. alter regedit? write protect? set to 0?? = FAILED!!! 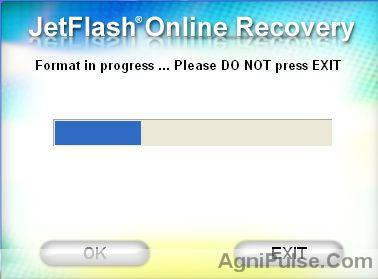 3. download jetflash recovery tool from trascend site??? = NO DEVICE DETECTED!!!!!! 4. windows format?? disk management??? diskpart command?? = FAILED!!!! 5. Alcor Transcend JetFlash OnLineRecovery (AU63XX, AU69XX) = SUCCESS!!!!!!!!!!!!!!!!!!!!!!! I have the same VID and PID as you but this russian application does not detect my USB. Can you give instructions about how to use the application? I know my pendrive’s pid and vid, but the transcend online jetflash recovery.exe is not detecting my pen drive even though i can access all files stored in it. I want to format my pen drive, but I am not able to because its “write protected” and my pendrive has not switch. I tried “chkdsk /f F: ” but this also did not work..a message saying that it cannot be formatted as it is write protected came up. It can’t find my Divice! please help me friends. hey thanks for dis trick. dis worked with my pendrive.. I am using 8GB Transcend Pen Drive. I used it for 2 month. after 2 month it stop working .When i plug in the pen drive on my computer it does not show any response or pen drive is not detected.but other pen drive are easily detected again when i inserted my pen drive to other computer it is easily detected. what may be the problem? Is there problem in my computer or pen drive?Please repair my Pen drive to get back the Pen drive to use again and showing my files stored in the Pen drive. thax a lots buddy i tried several times from other web site but they enable to solve my problem ..
have a problem with memory stick TS16GJF200 (VID = 058F PID = 6387.). Thank God i am realy very happy. you saved my pendrive. super software after 1 year my pendrive is recovered. My 4 GB Transcend pen drive is not format by this software after formatting start after some time it says that unable to complete format. dude even my 4 Gb Pen drive is not working:( When i try to open it,says “please insert a disk into drive F” and even unable to fromat it with online recovery tool which gets stopped at intermediate during formatting and prompts as format failed. guys plzzz help me asap. Nearly at the end of formatting my pen drive, it prompts..Could not format the drive..Give it to the nearest store..:( what should i do? plz help.. Format Failed(0xFEE) is the message i get when formatting is almost done.. Probably this tool cannot fix all problems.It can only reflash the microcontroller inside the USB Drive.If the memory itself is spoilt, then you will have to take it to your nearest Transcend Store. thanks a million, really worked wonders. my transcend jet flash v90 appears as unrecognized device what can i do to fix it ?! hai,, anybody please help me… i’m bought 8gb transcend flashdrive.. still, i forgot my transcend flashdrive password.. how to recover or open the flashdrive…. Thank you!!! I shouted with joy when it worked.